Tranquil PC's Mini Multi Display PC (MMDPC) consists of a Sapphire Tech FS-FP5V motherboard with a AMD Ryzen V1605B Embedded APU, all housed in a tiny 100% fanless full aluminium chassis! Just add an M.2 SSD and RAM to complete the system. Tranquil's industrial and completely fanless chassis is optimised for efficient cooling and durability. The barebones system is designed to withstand both industrial and environmental hazards. 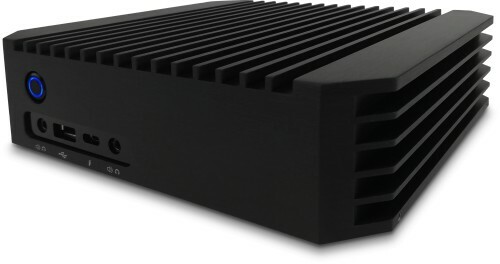 The proficiency of their fanless design means it is protected from dust, floating debris, and moisture that would naturally damage a typical industrial mini PC. With the elimination of the fan and the use of solid-state drives, there are no moving parts in the system allowing for a silent operation service, a significantly improved start up speed, and resistance to vibrations and shocks, allowing for a longer expected lifespan. The Mini Multi display PC provides powerful performance thanks to the supplied embedded AMD Ryzen motherboard from Sapphire Tech. The FS-FP5V incorporates an AMD Ryzen V1605B APU (Advanced Processing Unit) which features four cores and eight threads running at a base speed of 2.0GHz and a up to 3.6GHz turbo speed. A maximum of 32GB of SODIMM memory can be installed as well as a single M.2 SSD from 120GB to 2Tb, allowing for optimum enhancements. Furthermore, AMD APU features a Vega 8 GPU with a maximum memory share of 2048MB which gives good performance if it is intended to use the PC for light gaming. In addition, users can choose between Windows 10 Home, Pro or Linux as their operating software. 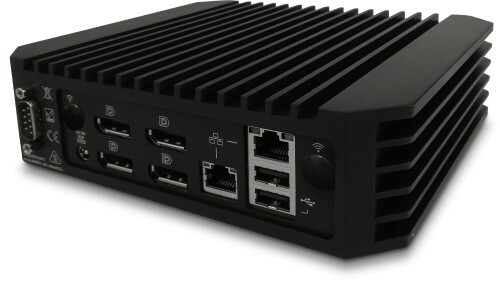 The system comes with a two Gigabit ethernet port (Realtek RTL8111G) and allows the option to include a Dual Band Wireless AC 7265 802.11ac Wi-Fi and Bluetooth card. There are a wide range of I/O ports, including a Line-Out, USB 3.1 Type C, USB 2.0, Mic-In, power/reset switch on the front. While on the rear is a RS232 (serial port), two ethernet ports, two USB 2.0 and four Displayport 1.2 ports and of course a DC-In 12 ~ 19v. Weighing at 1.8kg, this durable, yet sleek system creates the optimum balance of quality, efficiency and connectivity. This unit is ideal for scenarios where multiple displays are required boasting four Display Ports each capable of 4K output. With no moving parts and a rugged design, it can be embedded in any dry environment. It’s ideal for high resolution embedded applications such as electronic gaming machines, medical imaging, interactive digital signage, thin clients, POS terminals and more. Alternatively, if you are looking for a very small silent home or office PC the MMDPC is ideal. This rugged computer is the perfect tool for professional, industrial or home users. With its IP50 level protection, it can be used in constrained or severe environments. The milled and well-designed aluminium structure makes this chassis unique. Its conception proved its reliability in extended operating temperatures of between 0°C to 40°C.